We had a successful September NMixer, Have A Byte with Emuel, on the Grady lawn. 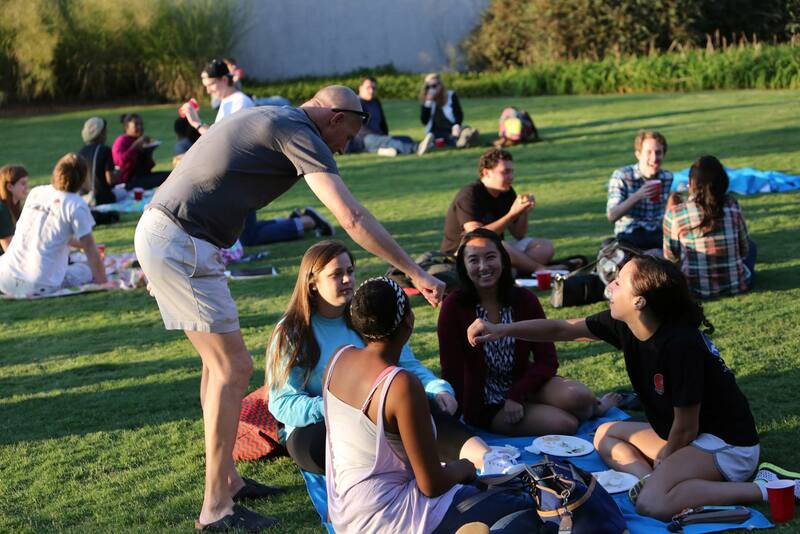 We celebrated surviving the first few weeks of the semester with a picnic dinner catered by our Chef-and-Coder-in-Chief, Emuel Aldridge. We had a great turnout of NMI students and friends who enjoyed Emuel’s great cooking and learned about classes that will be taught in the NMI Spring 2015. Classes for the spring are already reaching capacity, making this NMixer a huge success! The New Media Institute hosted new media anthropologist Amanda Concha-Holmes for our October NMixer. We had a great time and an awesome turnout! We welcomed guests from a variety of disciplines for our chat and an NMI information session. Dr. Concha-Holmes promotes the use of art, sound, videography, and an inclination for anthropological insight to improve collaborative conservation projects that raise awareness of intersections of power dynamics. Dr. Concha-Holmes was brought in by UGA’s Center for Integrative Conservation Research thanks to a grant from the Wilson Center for Humanities and Arts. We thank the CICR for allowing us to be part of her week here at UGA. Stay tuned for updates on all of our future antics.